"As my husband carried her wounded body, I held her broken leg, which was hanging, all the way to the hospital. The flesh on her right leg was falling off, and her bones were exposed. She was bleeding profusely. 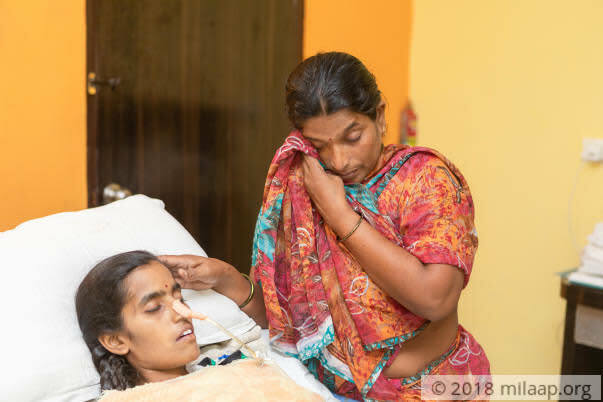 As she lay motionless, my husband and I did not know whether she would open her eyes again," - Kumari, Drowpathi's mother. Drowpathi was a young woman with great aspirations for the future. Despite poverty, Rangarao and Kumari were always supportive and encouraged her to aim high. She was pursuing MBA only to work hard and take care of her poor family. "My daughter attended 4th semester MBA exam in Nuzividu city. She met with this terrible accident when was traveling back to our village on a two-wheeler with her friend. The rider was trying to overtake the lorry but unfortunately, he hit vehicle. Drowpathi's dress got caught in one of the tires of the lorry and her leg was smashed within seconds. When the driver of the huge vehicle applied the break, she was dragged on the road for one long minute and soon fell unconscious. While her friend was left with a leg fracture, my daughter was nearly killed in this horrible accident," - Kumari. Drowpathi's right leg below the knee was crushed, a major part of her flesh and skin was completely torn off from the body. She also suffered multiple injuries in this terrible accident. 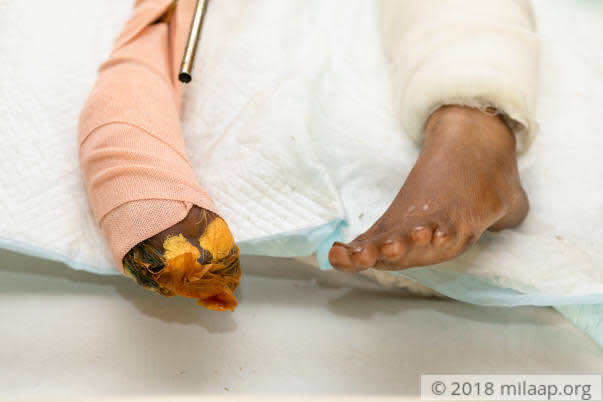 She underwent more than a couple of surgeries to remove the damaged parts of her leg and to attach a large broken bone with a rod. She had also undergone a treatment to remove the infection that was developing in her leg as the flesh was exposed. "My daughter is not out of danger yet, she needs a couple of more surgeries to be able to walk in life. She should undergo debridement flap cover surgery and skin grafting to close the wound as the shin bone on her right leg can still be seen. 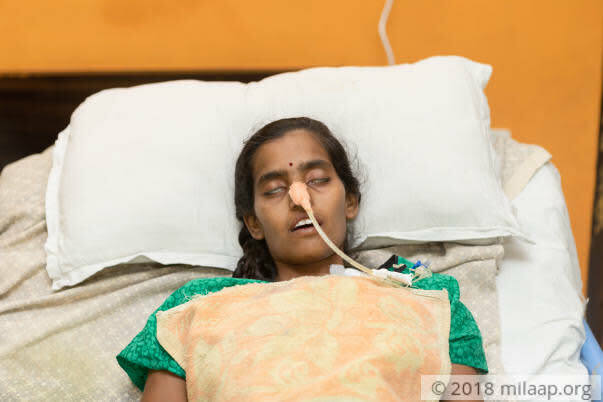 After the treatment, she needs to be under observation for five weeks in the hospital," - Kumari. 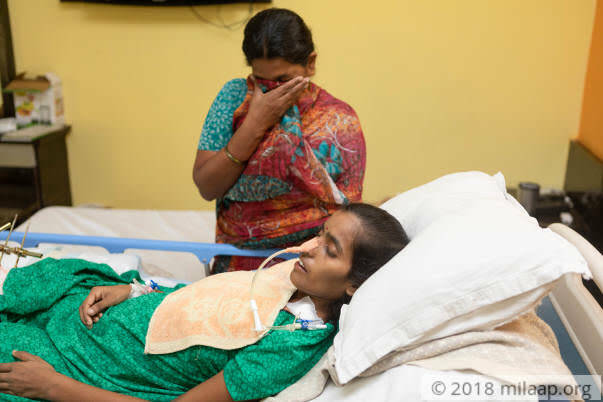 Two days after the accident Drowpathi's mother notices burns on her hips and upper part of her thighs. After the accident, the onlookers helped her body in a sitting position on the road until the ambulance and the family arrived. Due to high temperature from the impact, the skin was burnt and she was wounded. "When my daughter came to consciousness, she was shocked to find herself in the hospital. I couldn't answer her questions. When her father told her what had happened, she was shocked and was checking herself thoroughly. When she removed the sheets and saw her leg, she flinched at the sight of the bone and flesh and broke down into tears. She is completely bedridden and not even able to cry out her pain. I often find her silently shedding tears. 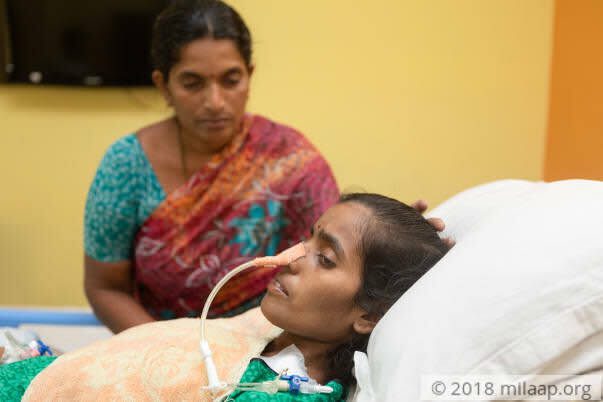 It deeply hurts to see my daughter go through such agonizing pain," - Kumari. Rangarao and Kumari are daily wage laborers who earn Rs 450 a day, together. The family is overwhelmed by the expenses of the treatment. With this minimal income, it had become difficult to run the house and manage the medication. They have already spent 14 lakhs on her treatment and have exhausted all their savings. 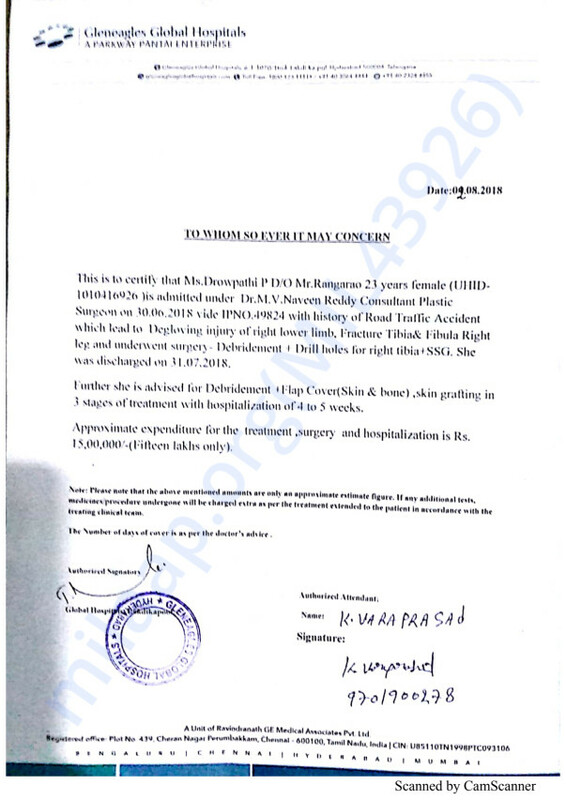 The family needs 15 lakhs for the surgery and are in major debt. "We ran to every friend and relative we knew and begged to save our daughter. We have borrowed a huge sum from them for her surgery. We are overburdened with the expenses of the treatment. Now we are left with nothing but empty hands to pray for help," - Kumari. 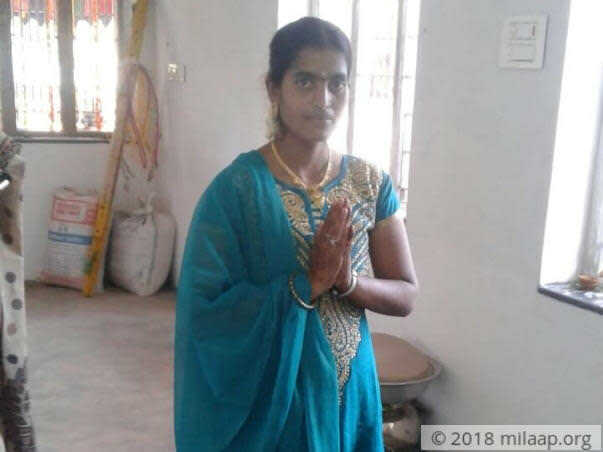 23-year-old Drowpathi had suffered a fatal road accident which left her right leg crushed and a major part of her flesh and skin was completely torn off from the body. She immediately needs to undergo a couple of surgeries to recover her leg. The desperate family has done everything they could and now are lost in every way. Without your help, she will never be able to walk. I would like to thank you all for the continued support shown towards our cause. Drowpathi was suffering from nerve problem. Hence, amputation is done to her right leg. Wounds are still there and for the same dressing is done everyday. She is under medication and is recovering well from the surgery. Currently she is at home. Thank you all! Please pray for her health. Drowpathi completed her treatment and is being discharged for now. She will be coming back for further surgeries and treatment. She is recovering slowly but well. Thank you for the support you have shown. Here is an update on Drowpathi's health. She underwent a skin grafting surgery last week on her hips and upper part of her thighs. She will undergo the other surgeries after the first week of September. She is currently staying near the hospital so that she does not have to travel much for the follow-ups.